"Give me your definition of what it means to be a girl?" That is the question photographer Kate Parker asked 13-year-old Callen Swiegart between her football game and cotillion class. "Give me your definition of what it means to be a girl?" That is the question photographer Kate Parker asked 13-year-old Callen Swiegart between her football game and cotillion class. "Being tough enough to do things that boys can do but soft enough to do things they can't," was her insightful answer. Every weekend Callen and her friends live just that. The Roswell, Ga. seventh graders proudly take on boys the same age in an otherwise all male flag football league on Saturdays and then Sundays the girls head to cotillion class. 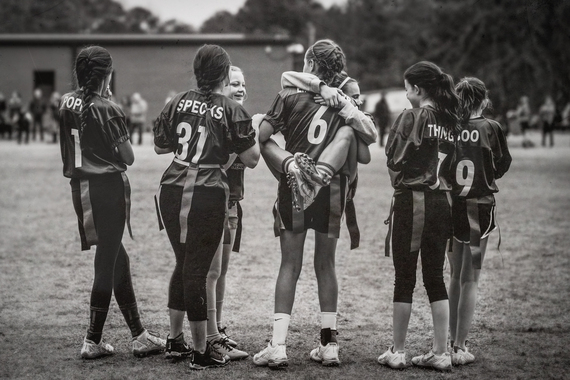 They cover their scrapes in makeup, their eye black is replaced by eye liner, and the muddy cleats are swapped for pretty flats as they participate in a southern tradition very much the opposite of football. Parker set out to chronicle the contrast of the traditionally feminine and masculine roles she was seeing the girls live every weekend. "The girls seem to revel in the camaraderie and challenge of football and appreciate the directives of cotillion," says Parker. "One emphasizes manners and being nice southern ladies and the other is completely the opposite. As a mother of young girls, it is my mission and goal to always encourage them to be themselves, to explore whatever interests them, regardless of gender roles or expectations." Parker is passionate about her photography documenting and showcasing brave young women who challenge roles and are not afraid to be themselves regardless of what anyone thinks. 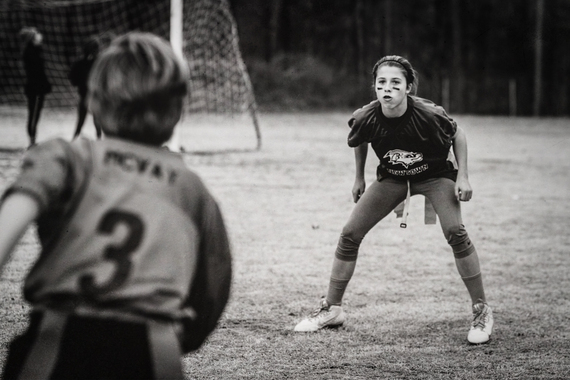 "Being a football player one day and a southern lady in training the next is such an interesting dichotomy, I knew it would make for some fascinating photographic images." With her camera in hand, Parker went to the football games on Saturdays and watched how the girls fought hard for a 1-7 record. Their coach, Steven Sweigart, was impressed: "Coaching these girls was one of my favorite experiences with the game of football. It's a demanding sport and even though the girls didn't know football when they started and they got pushed around in the beginning, they kept fighting. These girls never gave up, they are beautiful warriors." On Sundays, it was time for cotillion preparation. The girls take out their ponytails, put on their fancy dresses and name tags and head to the local country club. "Cotillion is a series of classes popular in the South that offer instruction in manners, deportment, social graces and dancing. With the girls cleaned up and blown dry, scrapes and bruises can still be seen on legs and faces from the day before," said Parker. 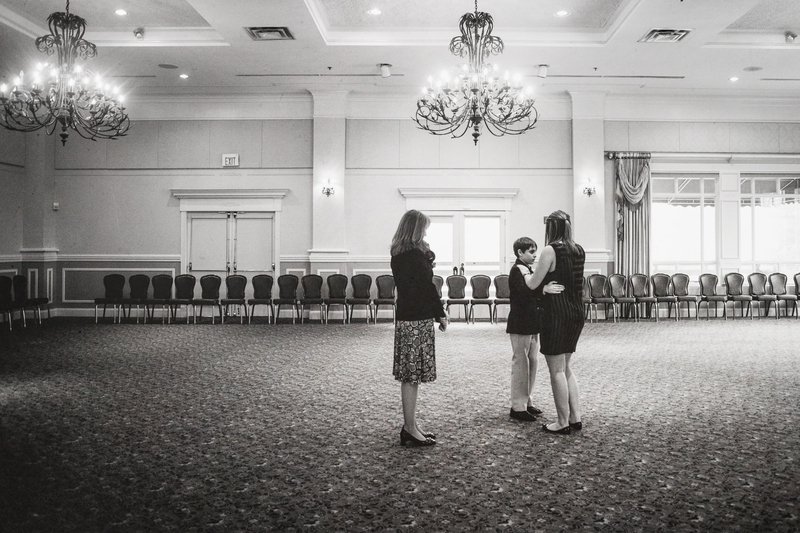 "But Sundays they aren't blocking and tackling the boys anymore; they are accepting a boy's hand to lead them to the dance floor and Cha-Cha." 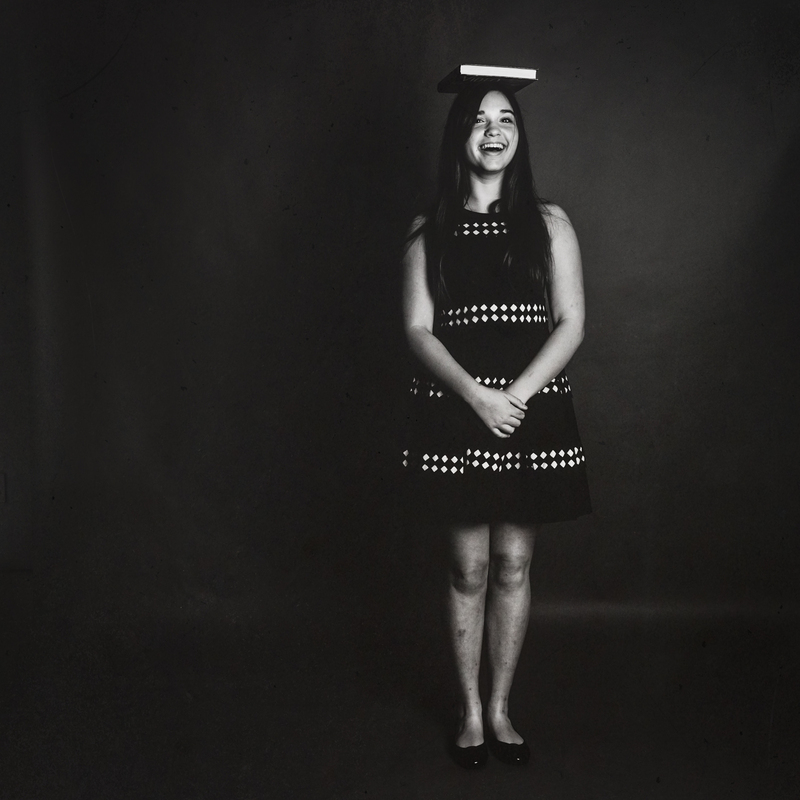 As Parker turned her camera on the beautiful duality of it all, she noticed that both experiences seems to be empowering for the girls. 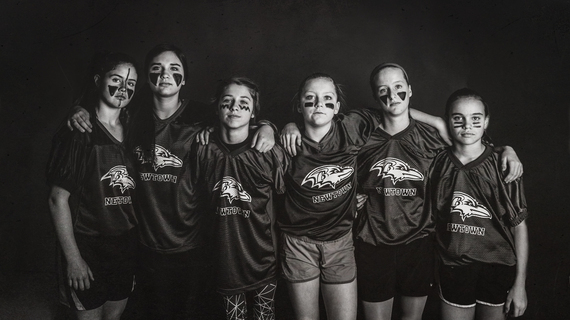 The fact the girls stepped out of their comfort zone to play football with the boys, despite feedback that they "would not be as good," changed their perceptions of what it means to be a girl. The other parents felt that too. "As the football season progressed, I saw my daughter's confidence soar after she realized that she could compete with boys her age who have played football for years." said parent Karen Ford. Mom, Felicia Teffeteller, agrees: "The girls wanted to see if they could do something without any knowledge or experience. They were the underdogs and came out on top. They didn't win the division but boy did they ever win in life! They discovered that stepping out, trying something new, and sticking with it until the end is a life skill they will have forever. I know this experience is going to transform them in other areas of their lives. They now have confidence and awareness that they can do things unimaginable. You never know who you really are or what you are capable of until you step outside your comfort zone. Just imagine what we could all accomplish by following the hearts and attitudes of these girls." Parker asked 12-year-old Abby Teffeteller how participating in both the football and cotillion made her feel. "It's kinda of funny that one day we are blocking and knocking boys down, then the very next day we are holding their hands and learning new dance moves. It's fun to get muddy, dirty and smelly then go home and get all cleaned up, dress up in something pretty, do our hair and get to be a "girl". We are lucky that we get to enjoy both sides. I love it!" 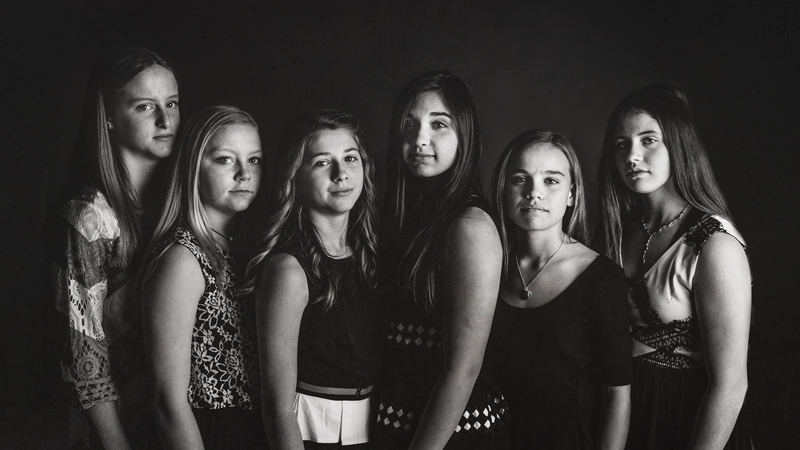 12-year-old Keely DeWit said that her weekends of football and cotillion gave her a new way to look at being a girl. "To be a girl means to be passionate and caring and strong. It doesn't mean you have to be a cheerleader or wear dresses or skirts to school all the time. You dont have to be the most popular person in the world. You have to learn to be yourself. I am a girl and I am very sporty and love to run around but also love to be beautiful and classy in my own way." Logan Speckhart now realizes she "can knock down a boy on the football field and they still look at me like I am pretty." But perhaps one of the more telling responses Parker got when asking 13-year-old Grace Ford if girls can be tough and feminine at the same time. Her answer? "Yeah... Duh!" Football on Saturday, Cotillion on Sunday: A weekend in the New South.